A redirect is a way to send both customers and search engines to a different URL from the one they originally requested. This article talks about creating 301 redirects in Help Scout Docs. You've created a brand new article to replace an old article. Maybe you've deleted the old article, or the original article URL was sent out in an email at one point in the past. Creating a redirect for this article ensures that readers can access the new, updated article from the old URL. You're moving from another help desk, and you want to make sure that old, lingering articles correctly redirect to your Help Scout Docs site. This method requires that you have an active CNAME that points to your Help Scout Docs site. 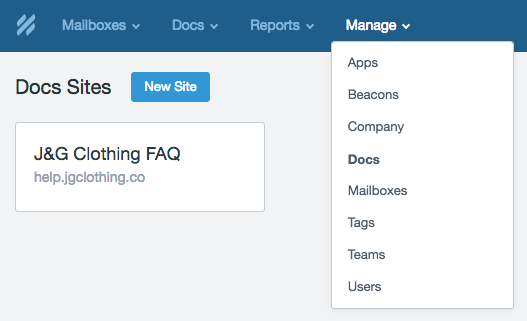 Head over to Manage Docs and click on the Docs site you'd like to setup redirects for. Click on Redirects under the Docs Settings sidebar. Then click on the blue Add Redirect button to start adding redirects. In our example below, we're redirecting an article from an old help desk URL, to the new article that exists on the Help Scout Docs side. Click the Save button to save the redirect. Original URL path should be the exact path of the old article. The Redirects To field is the URL of the existing, published, Docs article you want customers to reach. Note: It's worth mentioning that you don't have to redirect articles to Docs. You can point an existing Docs article to any external URL.